Ultra-low reflectivity of Si surfaces, resulting from the formation of a nanocrystalline Si layer, can be achieved simply by contact of platinum catalysts with Si wafers immersed in H2O2+HF solutions. 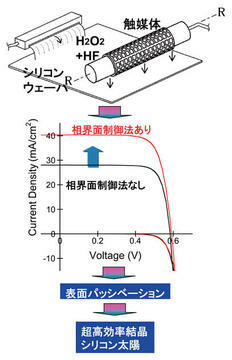 Using this method in fabrication of crystalline Si solar cells, high photocurrent density can be obtained. Due to low defect densities in the Si nanocrystalline layer, high photovoltage can be realized with the surface passivation method. Consequently, this interface control method can achieve ultra-high conversion efficiency under low costs.